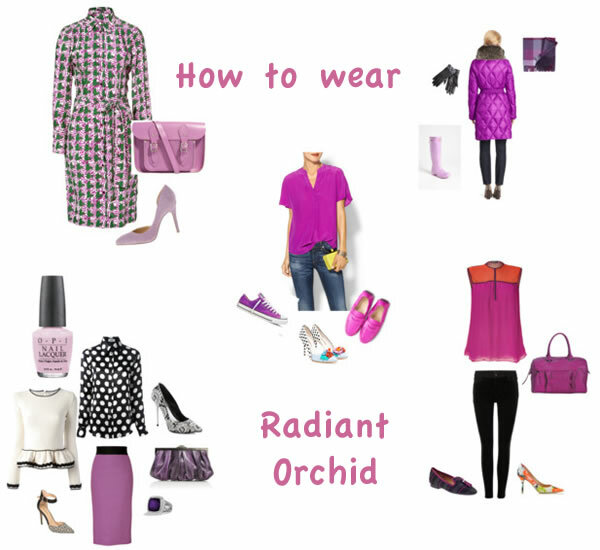 How to wear Radiant Orchid – the ultimate inspiration guide! 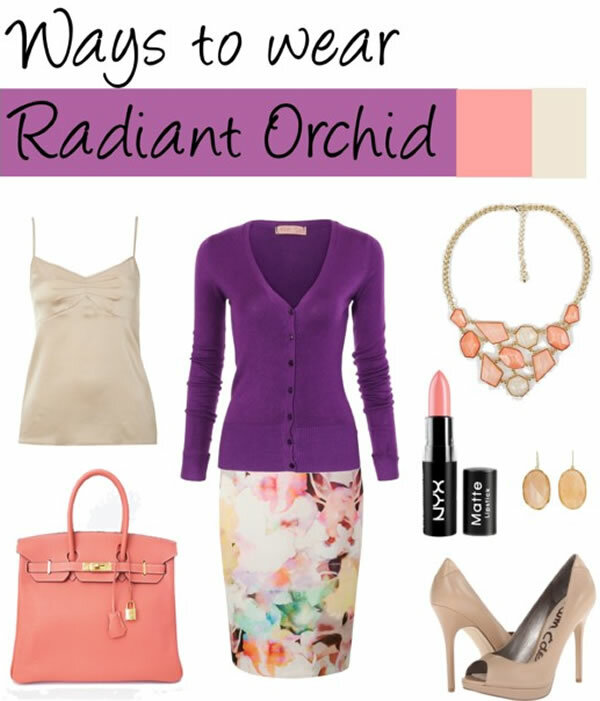 40+ Style » How to dress after 40 » How to wear Radiant Orchid – the ultimate inspiration guide! 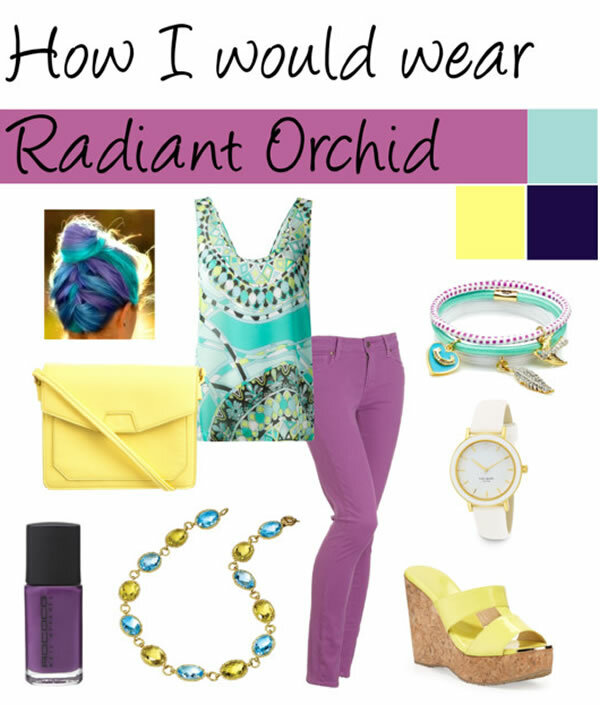 To say that I’m absolutely blown away by your submissions for the mini radiant orchid challenge is an understatement! 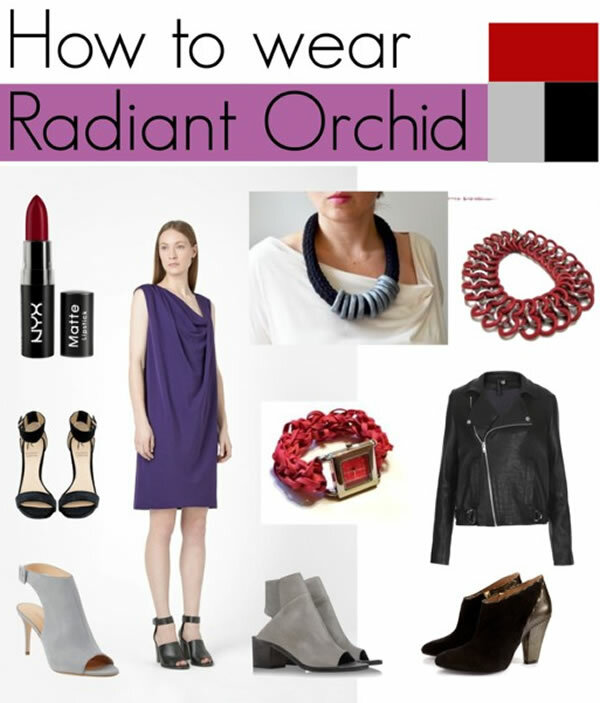 I’m very impressed by your creativity of creating and finding beautiful ways to wear Radiant Orchid. 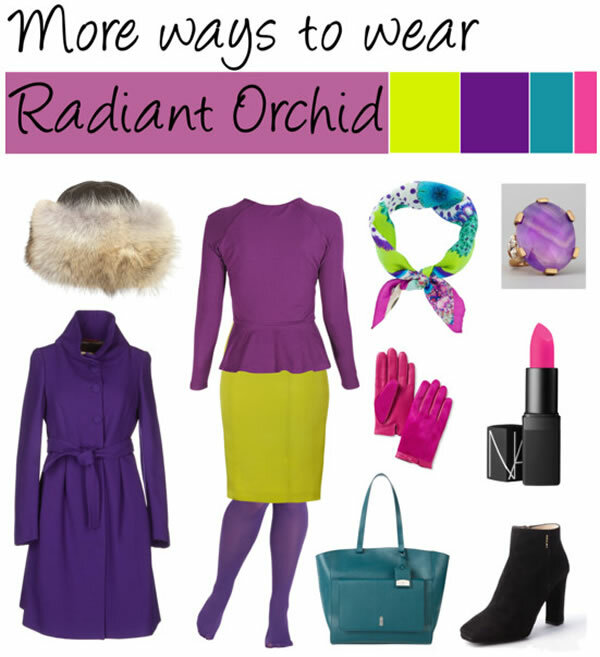 So without further ado, here is the ultimate inspiration guide on how to wear Radiant Orchid. As reference, here are some of the initial color combinations I presented you with. At the top and below are two of my own creations, using the color palettes Mysterious Vibe and World Orchid. 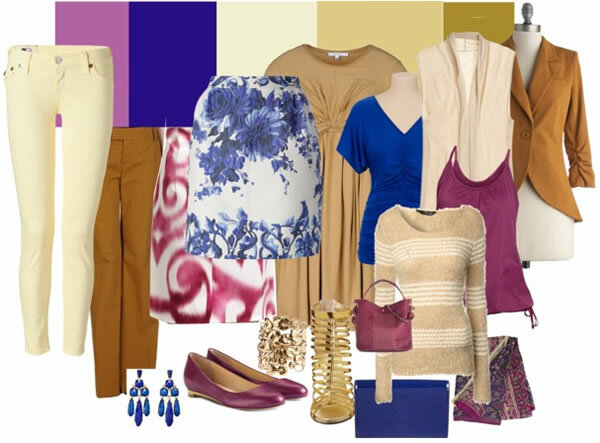 Lisa (Polyvore) has create several glorious collages and color combinations. I love this very fresh combination of light mint, moss green and see blues. Here she uses radiant orchid with royal blue and neutrals. Lisa writes “I really wanted this to be for spring and wanted a short sleeved sweater, but couldn’t find one”. This one was inspired by the ’80s. “An updated color scheme from the ‘80s pink and green preppy look”. A darker palette more suitable for autumn or spring. This one is for those who want to embrace pastels this season. Finally her last collage is a very vibrant color combination, ready for the tropics! 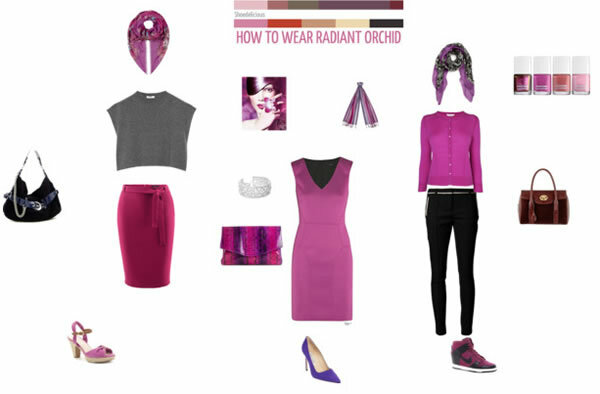 Melissa (Polyvore) created a fabulous radiant orchid outfit for work. I would honestly wear this for other occasions as well. So chic! 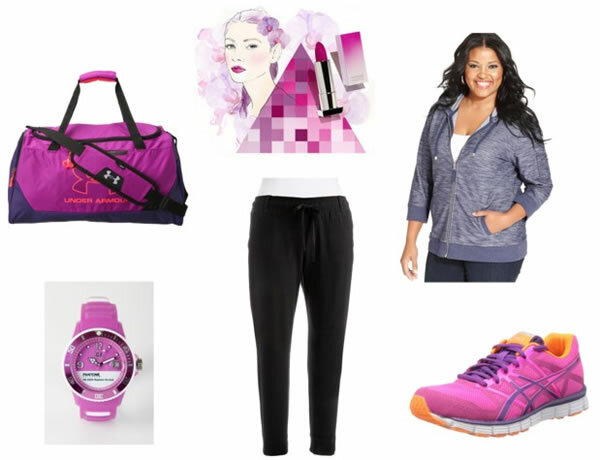 Suzanne (website | Polyvore) still finds this a difficult color to play with, so she has taken baby steps incorporating this color with her funky radiant orchid shoes! Trina (website | Polyvore) loves to combine it with darker colors like black as well as in a colorful dress! 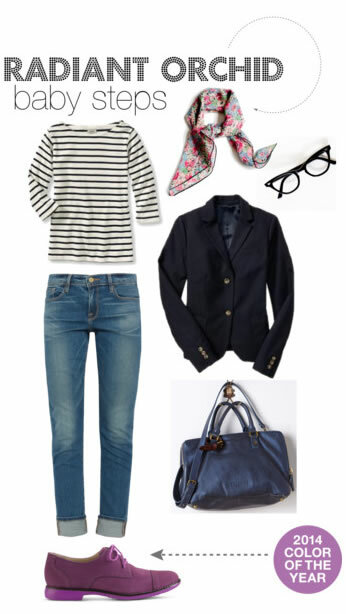 Sue Walker (Website | Polyvore) tells us she is a Natural Gamine, which she likes to call Casual Chic. This is her take on the Colour for 2014. 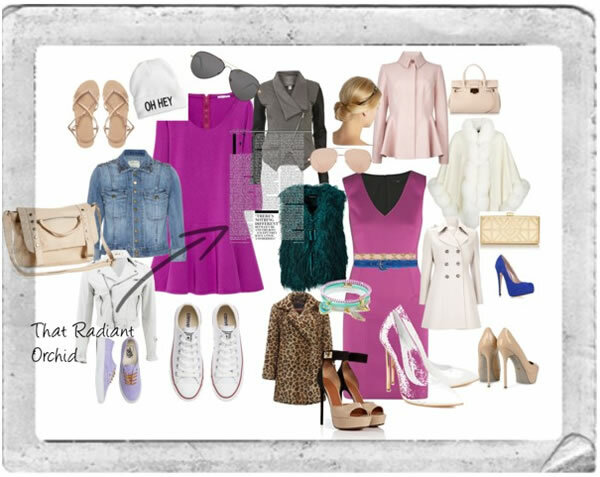 Kay (Polyvore) takes a more casual approach to wearing Radiant Orchid. 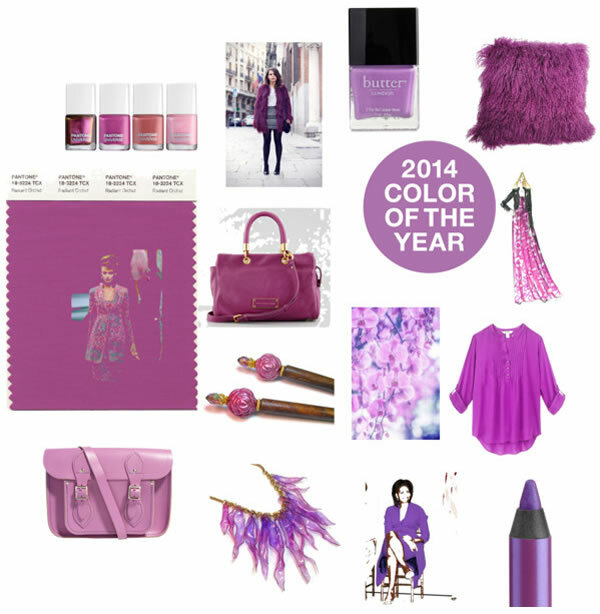 Sabine (website | Polyvore) tells us that radiant orchid matches her skin complexion perfectly. As she blogs about elegance & ease she wanted to create a collage that incorporates both those elements. 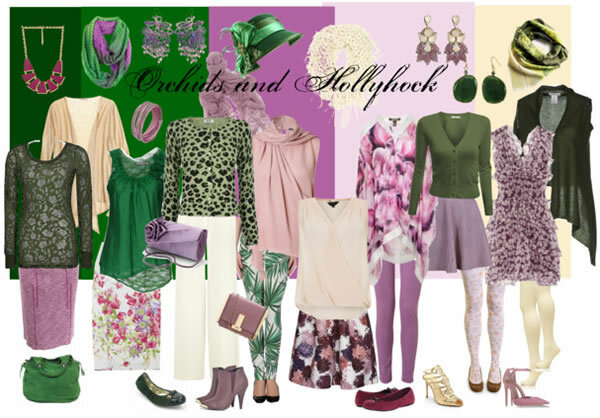 Lorraine (Polyvore) created 8 wonderful combinations with Radiant Orchid. The first one is Minty Rose Orchid; a very refreshing combination that is great for summer! As is this one. Very fresh and sunny for summer! Fun in the Sun Orchid! Another great one for the beach. 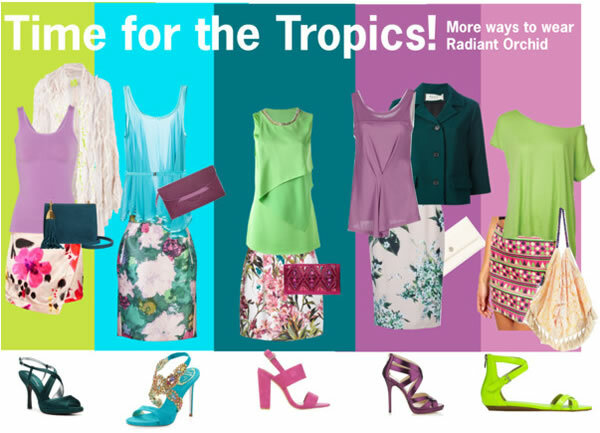 Very Fruity Orchid can work for both spring and summer and could be worn to the office. 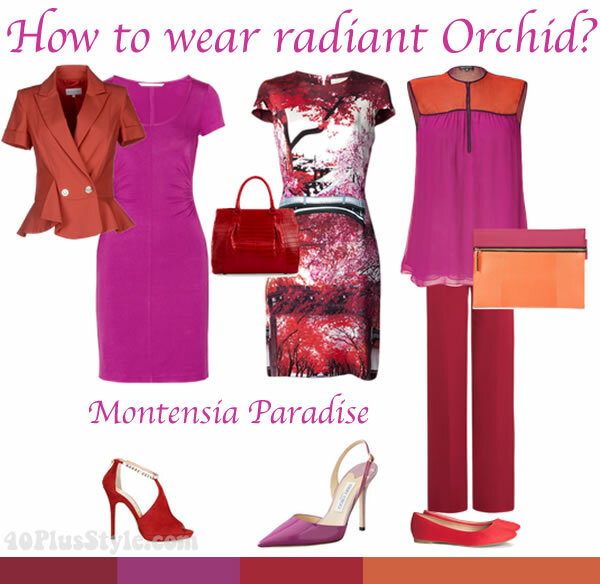 This is great party look: Coral Pop Orchid. 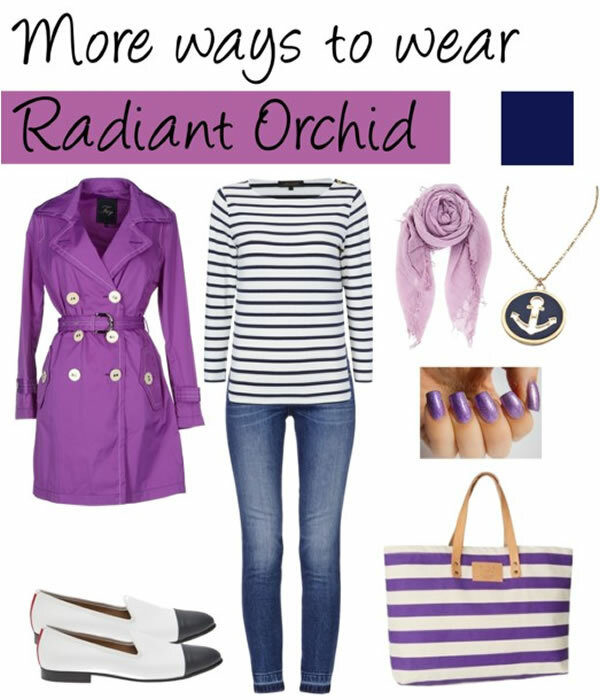 Nautical Orchid is great for a casual day. I think Lorraine created this one with me in mind. You totally get my style Lorraine. I would wear each piece of this collage! This is what Lorraine would wear herself. She says that the cardigan is a bit too dark in this picture though. 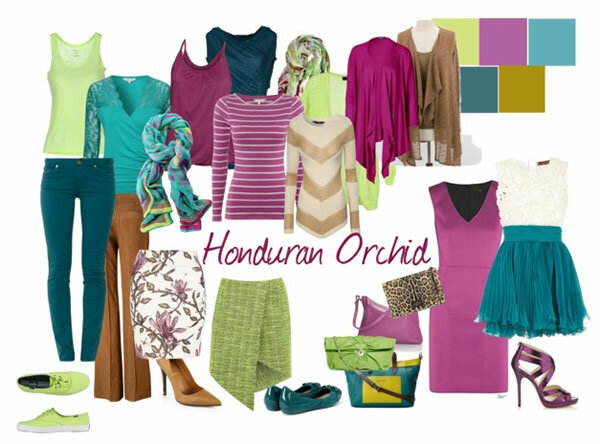 All these color combinations and ensembles should give you plenty of ideas to wear this vibrant color coming spring and summer. 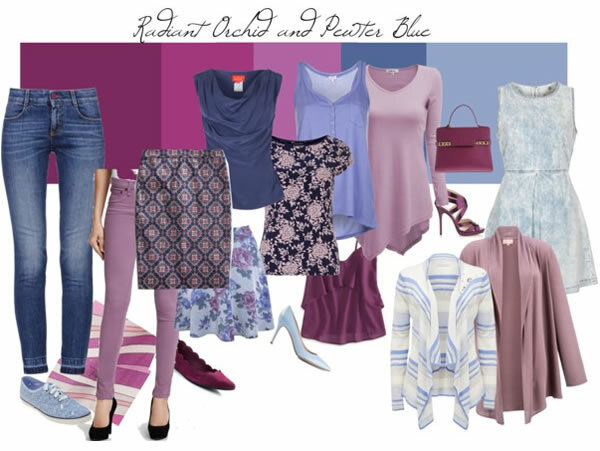 If you are inspired to wear radiant orchid, here are some of the items from the collages or inspired by them that you can buy online right now. 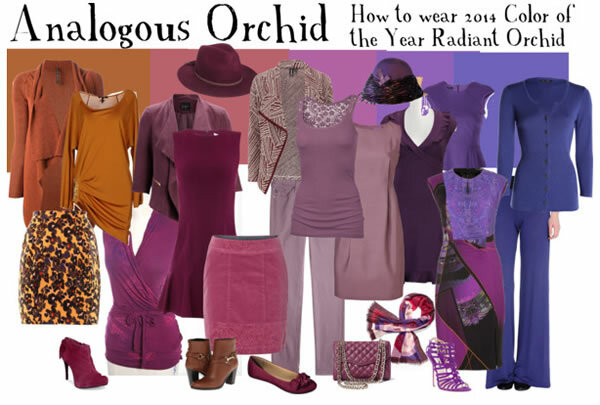 Are you looking forward to wearing radiant orchid? Which is your favorite color combination / collage from all of the above? Wow! Wow! Wow! What an amazing blast of colours and ideas to get up to this morning! I feel enthused and inspired by everybody’s ideas! I think we have proved that it can be fun or sophisticated, suitable for different seasons and generally very wearable! I could easily wear everything on your collages, Sylvia. Thanks for including my ideas. Yes, I will go back to this page often and get ideas! You did an amazing job Lorraine. Loved all your collages. These colour combinations are fabulous. There is definitely something for everyone here, no matter what your ‘colour season’ is; from pale blond to very dark hair. Lots of ideas on style too and I love them all. I agree Aileen. The variety is just amazing! 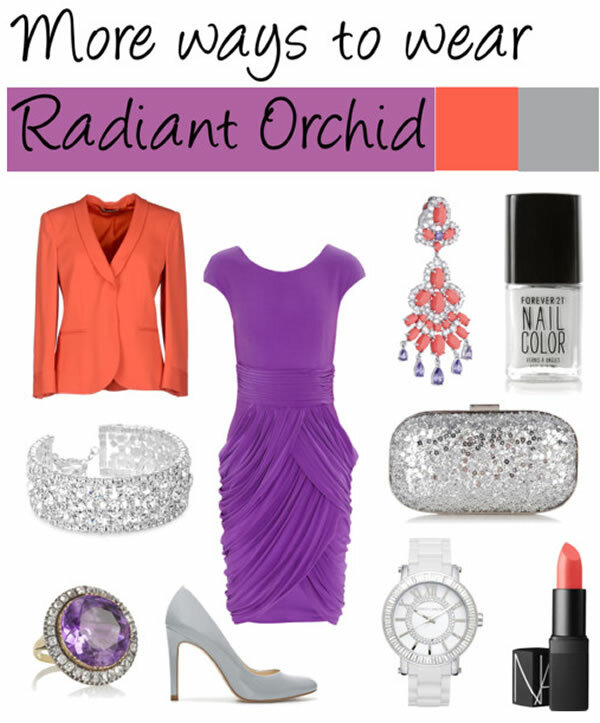 With all of these beautiful choices, how can one go wrong with radiant orchid. Thank you for the inspiration! You are welcome Judith. I’m looking forward to seeing how you will wear it this year! 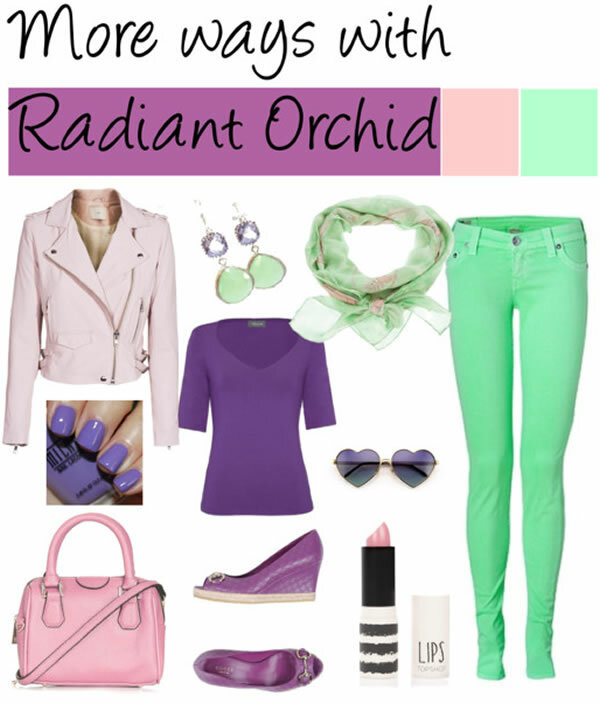 Polyvore is sadly lacking in true Radiant Orchid choices. A lot of what I actually put together used magenta or mauve. Yes, you are right. Although there is a way of getting your own images and products you find into Polyvore. Did you get the little “clip to polyvore’ tool in your browser yet? Thank you so much for your wonderful collages and color palette. You did an amazing job! And you’re welcome. It was fun. The clip to Polyvore tool is useful – I was able to find pics of things I actually own and clip them for my collages. You can also clip to Polyvore from Pinterest. Good luck! Amazing! Wonderful inspiration and so many beautiful color combinations! Thanks so much for participating Sabine. You created a great collage! OMG! you have worked so hard!!!! I like all of them so much!!!! Very good all these boards together.. Gives us plenty of ideas.. My favourite one is lime (or can I use any green???) with orchid (fuschia in my book). Or orchid with yellow.. And I can shop for it kn my own closet. Yeah! Wow what a great post. As it is still the cold and dark winter here in Canada this gives me hope that spring is just around the corner. 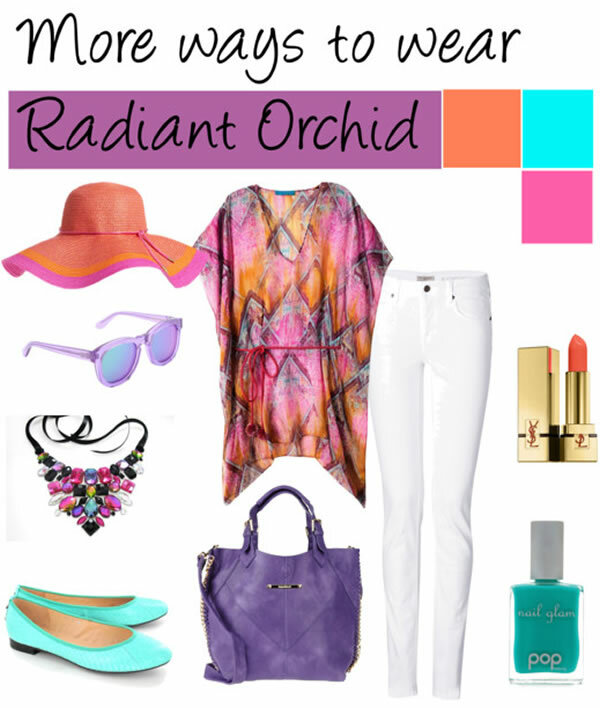 I personally love radiant orchid paired with a graphic print. Maybe a black and white graphic cardi wrap over a nice sheath dress, or a chic orchid blouse with a graph pant. Hi there. I struggle with this colour as I have found through trial and error, that if I wear any colour which has had black added to it, I look drained and washed out. 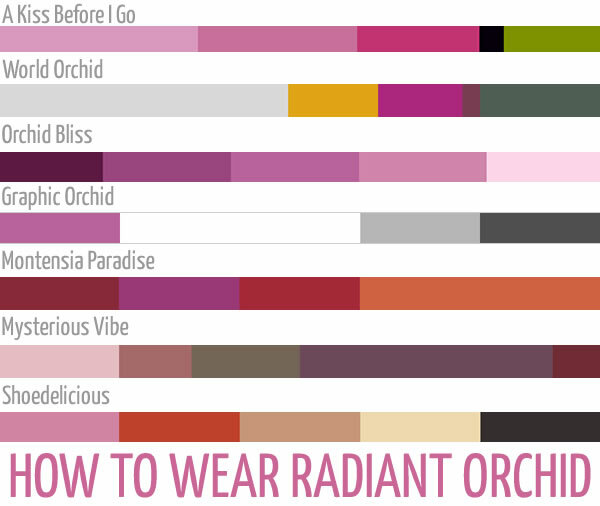 Unfortunately for me, Radiant Orchid is a no go area. On the other hand I look great in her sister colour Fuschia and her cousin, watermelon! 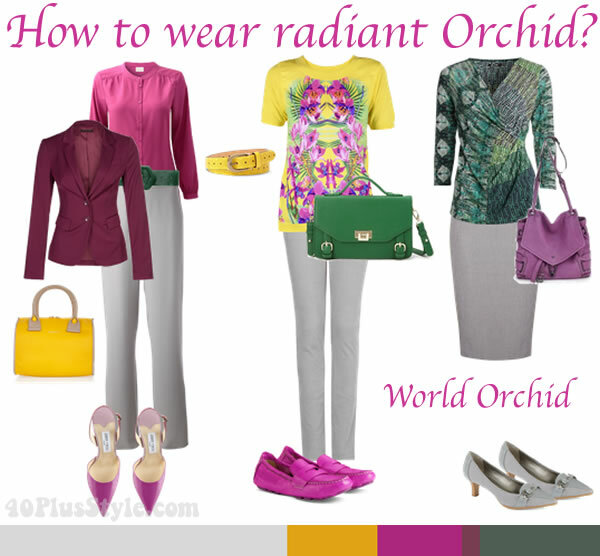 How to wear radiant orchid – create pleasing color combinations!